Support Trump? Want to earn $1,000?! Here’s how!!! Much like his verbal incoherence, Trump’s combination of limited vocabulary (like his Mexican counterpart, it appears he has never read a book) and partial iliteracy seems to endear him to his supporters, a large proportion of whom would not only put up with his spelling mistakes but actually anything he could conceivably do (including total nuclear annihilation, but quite possibly excluding his speaking out for protests and against racism. They really won’t like that in the slightest). Maybe in tribute, his supporters’ tweets are similarly poorly composed. Uniformly so, in fact. Given that there are only 140 characters at steak, you’d think that just once one of them might produce an accurately-written post, but no. So far not one Trump supporter has been able to produce a single tweet which does not contain at least one glaring and laughable mistake. Maybe it’s a question of motivation. After all, Trump’s political victory was the ultimate realisation of the principle that money is the only driving force in any human endeavour. Maybe if his hate-addled disciples had a gold-plated carrott dangled in front of their faces (they’re already seem vulnerable to various hypnotic effects), it might propel them to think more carefully about their spelling, punctuation and grammar. Trump’s own linguistic incompetence is not in this sense a cause for optimism, but maybe he just has too much money in the first place. Although he’d happily set fire to his own trousers for $1,000 (or its rouble equivalent), he’s not intrinsically motivated to do so. His supporters are another kettle of deplorables entirely. Lots of them could certainly do with such a sum. I’ve decided to help out. 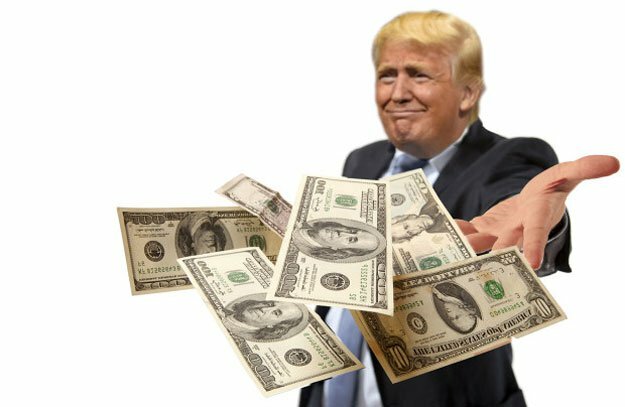 I am offering that amount via Paypal to any Trump supporter who manages to compose an error-free tweet between now (mid-August) and Christmas. It does not have to be a work of pithy genius – a simple statement regarding current events from the standard wilfully myopic/blissfully misinformed perspective will do. It just needs to obey the basic rules of English orthography, grammatical structure and punctuation. If it were also possible to make it factually accurate, that would trigger a million-dollar jackpot bonus; however, its not feasible that any statement based on factual information could be supportive of Trump, and in any case I don’t have access to that sort of money, not being, like some, in league with the mob. To give budding entrants some practice in spotting their errors, I’ve litered this post with several speling, punctuation and grammatical mistakes of my own. However, as always on this website, their are no prizes for pointing them out. This is, after all, merely a blog, not an official statement on behalf of the Comander in Cheif or anything like that. As for whether or not you should trust me…maybe you should look up the spelling and the meaning of the word ‘gullible’. * Nigel “Nazi flags in 2017? Whoever would have thunk it? !” Farage seems to have similar issues with his own dad, his initials being by no means a coincidence. ** There’s also the hilarious possibility that Trump was trying to be presidenshul, viz. like Obama. Next Post No one deserves to lose their home to a hurricane. Well, almost no one.